Through programs managed by Environmental Health and Safety and Risk Services, UC Santa Cruz has significantly improved safety and reduced the number of employee injuries. The efforts have saved the campus $3.7 million in workers' compensation costs last year and led to systemwide recognition. 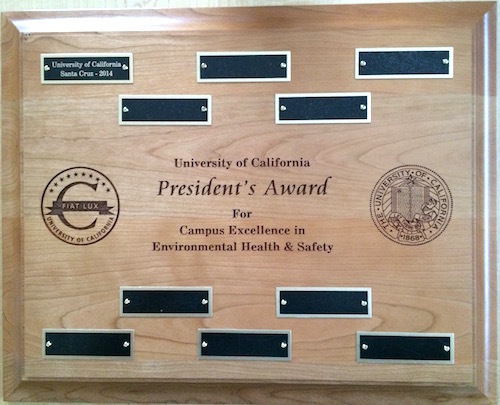 The University of California President's Award for Campus Excellence in Environmental Health and Safety is given to the UC campus with the greatest reduction of Cal/OSHA recordable cases (medical treatment beyond first aid) in the past year and the overall reduction in injury rate from previous years. UC Santa Cruz achieved its reduction through a joint effort between all the campus partners who focus on mitigating risks. The types of injuries prevented include slip/trips, ergonomic problems, wellness, and more. The campus EH&S and Risk offices used temporary UC Office of the President "Be Smart About Safety" funding to create a safety wellness injury management team that includes: safety and loss prevention specialists, wellness coordinator, ergonomist, transitional return-to-work coordinator, safety trainer, lab safety staff, and others. These individuals proactively create and implement safety programs. They also investigate accident and meet monthly to discuss all injuries that have occurred and put in place new preventative measures for the campus.